Shopping Galore: Delonas' NY Post Cartoon of Dead Chimpanzee RACIST? Delonas' NY Post Cartoon of Dead Chimpanzee RACIST? What do you think? Is this NY Post cartoon has something more in it? 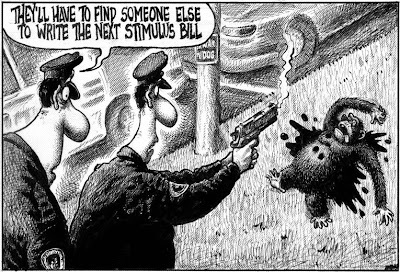 They say that it is like telling President Barack Obama must be assassinated, because the police said that "They'll have to find someone else to write the next stimulus bill." If this NY Post Cartoon is really referring to President Obama, then Delonas is a racist. Why would somebody compare a Black President with a monkey?